I'd like to go back in time and change my mum's subscription from "Canadian Living" to "Woman's Day", it seems like the "Cool mom" magazine. Anyone know the date of the issue? I don't ever recall seeing this playset. Looks fantastic! However, living in Iowa, I was able to recreate an authentic Hoth playset outside in the snow with my Star Wars and G.I. Joe figures. I think I remember this, my mom did subscribe to Women's Day. I seem to recall cloud city and Dagaboha [sp?] play sets as well. There were not made for commercial sale. These were home made, designed to inspire you and dad to hit the work bench and make something together. Wow, I don't remember ever seeing that in production in the states, and I'm very well versed in Kenner stuff, and knock off products too. My mother made me one and it was great, I believe there were plans included with the article. I played mine to death and a year or so later I made my own slightly bigger version with a better grade of Styrofoam. I think we omitted the trampoline, though. Even kids with names like "Charles Bebbington III" typically didn't have that many multiples of the same figure. Women's Day hired the same photographers who did the boxes of all those Kenner playsets.... The ones who'd use equivalent of a toy store's entire Christmas shipment to re-create the Emperor's Death-Star arrival. Those photos, beyond the reach of even the rich kids, are directly responsible for the untold numbers of traumatized 40 and 50-somethings out there who are finally vanquishing some very old demons by doing things like -this- in their living room. This is an incredible play-set, even for something "home-made" (by a professional photography company). Like most dream lay-outs in the magazines, results at home were a bit more modest. 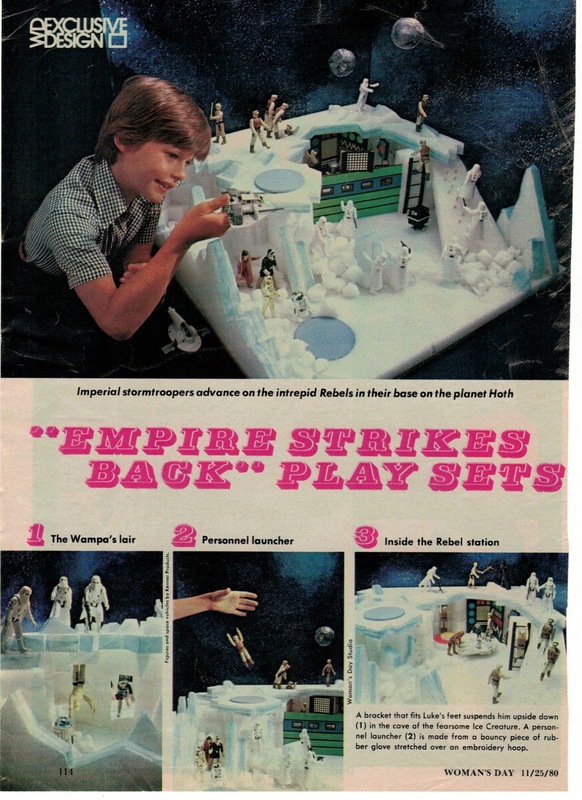 For many of us, our "Hoth playsets" were a few broken sections of the styrofoam packing from an appliance. Not that there was anything wrong with that. Positively loving the fact the photo includes the mostly-forgotten die-cast vehicles. I'm probably not the only anon who, even when he realized he was too old to be playing Star Wars anymore, still held onto his Hoth Snow Speeder and Slave-1... just because. Blows the 'Rebel Command Centre' Sears playset outta the water (or asteroid field). Unfortunatly, my mother's absolute refusal to allow me to have any Star Wars toys (it was for nerds/losers, apparently), means I had to adopt a flat rock with some uncanny angles and pretend it was a Snowspeeder.